grouser (Ludlow, United Kingdom) on 13 December 2013 in Architecture. Terrific angle and interesting white colour scheme. A little bit of vertigo here! Fantastic capture! The light and angle is fabulous and creates a very artistic image. Excellent! so beautiful angle, frame, lights & perspective! Wonderful shot. I like the beautiful spiral image. Nice framing. This reminds me of that famous spiral (is it at the Vatican?) and it's equally as good! 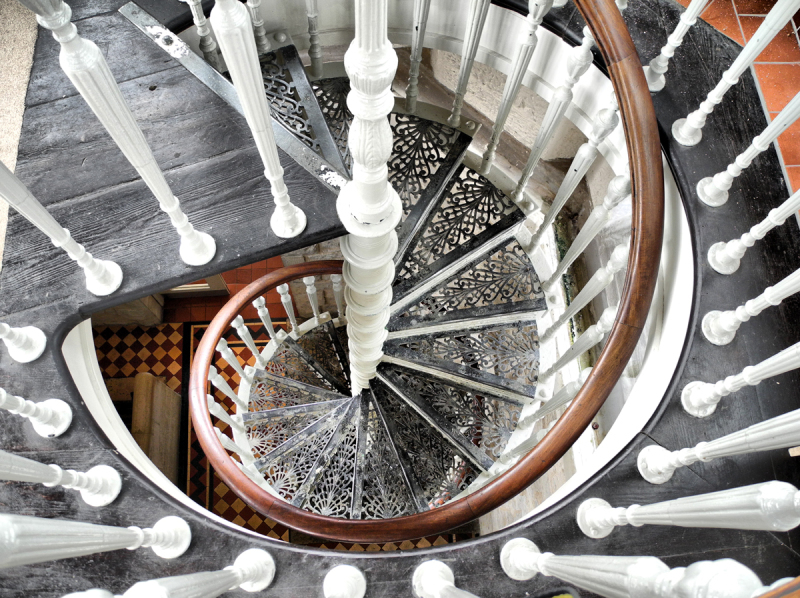 The spiral in a limited color scheme is great ... not sure I want to look down through those 'lacy' steps, though. Quel escalier qui tourne sueprbe perspective et effet à faire tourne la têtes. This has me thinking of all the calculations and decisions that were made in creating such a construction . . it still looks a bit improbable. Cool shot of these dizzying details.